It happens a few times each year in cultures around the world where people don colorful costumes and masks to take over the streets making a joyful noise. It is a symbolic inversion of societal norms and status where the average person can become a king, or a wealthy business leader can be seen scrounging in the dirt for a plastic bead necklace tossed from a parade float. It is a time for merriment and a celebration of The Fool, a letting go of convention and of ones self. This cultural phenomena is commonly understood as good for the soul and society as a whole. How could this tradition teach us something about our current political crises and the increasing incidents from the hacktivist network known as “Anonymous”? Artwork created custom for this article and shared courtesy of New Orleans own, Lionel Milton. Whose colorful work is seen in fine art galleries, album covers, murals and a newly released children’s book. Mardi Gras is celebrated in the tradition of Bacchus (Dionysus) who was known in Greek and Roman times as “The Liberator (Eleutherios), whose wine, music and ecstatic dance frees his followers from self-conscious fear and care, and subverts the oppressive restraints of the powerful.” Court Jesters are also common icons and archetypes associated with the festivities that happen in the lead up to Ash Wednesday known as Fat Tuesday, or Shrove Tuesday. Shrove is the past tense of the English verb shrive, which means to obtain absolution for one’s sins by way of confession and doing penance. 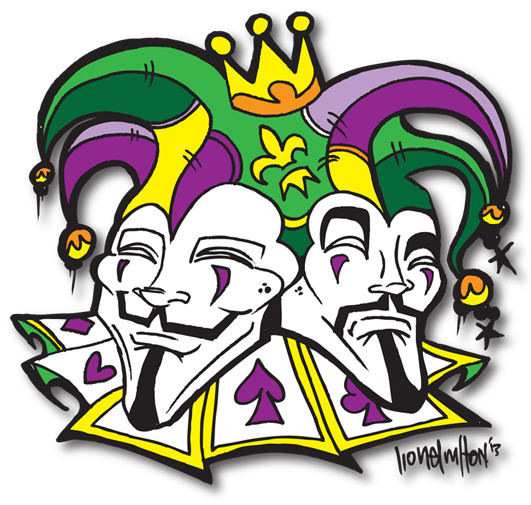 Each of these themes describing Mardi Gras could well be used to describe the prankster-like activities of anonymous hactivists. The leaking of confidential documents (such as the Edward Snowden NSA leaks) force a “confession of sins” by elected leaders. As a retaliation for the abuse of prosecutorial power in the Aaron Swartz case, hackers non-violently made a mockery of The Department of Justice website by replacing it with a video game. These acts “subvert the oppressive restraints of the powerful” like the Court Jesters of days past. Beyond condoning or condemning the legalities of these acts, one must consider them as a natural response within society when people feel that the powers of their government are becoming oppressive or abusive. A healthy government or society allows humor to lubricate the social tension while responding to the peoples discontent. In New Orleans each year the mayor of the city hands over a symbolic key to the city to Rex, The King of Carnival. The system is not perfect since Rex historically represented the privileged class and often emphasized aspects of segregation within the city. However, the resourceful and creative Black and Creole community take this opportunity to mock Rex. Today, The Krewe of Zulu and Big Chiefs have become the cultural soul of the city and rule the festivities as much as anyone. This pageantry and theater has not been without violence over the years, but it has probably done more to quell violence and social tension by allowing people the opportunity to invert the daily norms and social structures of their community while taking over their streets with dancing and pageantry. Enacting the social tension in a creative way brings light to the tension as well as release in many cases. Legendary Big Chiefs like Tootie Montana, Monk Boudreaux, Victor Harris, and Chief Jolly (Uncle to The Neville Brothers), created a tradition of honor by transforming violence into competitions of beauty and pageantry. The city now enjoys a peaceful and integrated carnival. Sad is the state that forgets that its power comes from the people. Would hackers be releasing documents and vandalizing government websites if they felt that they were being fairly treated and adequately represented? Would governments be responding with disproportionate force if they were transparent and had nothing to hide? Probably not. How can we take lessons from culture and history and apply them to the present moment in order to maintain a healthy, creative, vital, non-violent society? Mardi Gras and the ancient traditions of revelry, music, masking and dancing may provide some answers for us and New Orleans may be holding the key. We all know how much can get done when nobody is concerned with getting credit, when many work together for the benefit of the greater community. In New Orleans at carnival time we see this when neighborhoods, families, and clubs or “Krewes” work together on floats and elaborate costumes for the pride and beautification of their community rather than personal credit or monetary gain. There is power in being anonymous and giving yourself to an idea that is greater than you without hopes of personal gain. The notion of service is lost when our wealthy, self-interested Democrats and Republicans fight to make sure neither side gets anything done for the people at large. It is reminiscent of that scene in The Wizard of Oz when Dorothy enters the castle and Oz is hiding behind a curtain pulling levers saying, “disregard the little man behind the curtain, I am The Great and Powerful Oz,” or the tale of the emperor wearing no clothes but walking proudly through the streets. The metaphors can enrage or bring levity, we get to decide. In the inversion of societal norms we have an opportunity to laugh at these embarrassing aspects of the human condition, to remind each other of what is truly important, to confess shortcomings, and release judgement. Given the opportunity to do this, we create space for the creative, the compassionate, the peace-loving aspects of our human nature to flourish. In serious times, the medicine of humor and celebration has the ability to bring deep healing. So find an event or make the trek to New Orleans for Mardi Gras. Don a mask and free yourself from your own sense of self, experience the freedom of revelry. Experience being an anonymous character participating in the drama of life for just a brief moment and perhaps the boundary between “us and them” will dissolve. There are stories of masked slave owners dancing with masked slaves and neither knowing or caring about who the other was behind the mask. In the end, when you lose the mask and drop the veil, you will have learned something transcendent about who you are. We are all merely playing roles. Some roles chosen, other roles forced upon us by circumstance. Everyone deserves the chance to be free of their circumstance, to be king, queen, jester or purely anonymous even if only for a moment. These bodies we wear like costumes will one day be returned, like ashes to the earth from where they have been borrowed. Life is a carnival, Happy Carnival Season!